Well I missed the last trial of the year, but cant be helped. The sheep were a little difficult I believe. We were shearing and my daughter Sam had an inter school sports day so I had to be there. It was fun anyway. Our liltte town of Darkan won the outright shield for the first time in over twenty years. So lets hope I can get my dogs trained and look towards next year. Balto’s dad, Ken Atherton’s Ramulam Gus was second in the open in Albany so he is going well. All my dogs are working well actually, just need a fair bit of polishing. 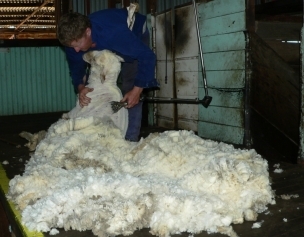 We have shorn all the wethers, a mob of dry ewes and all the rams. We still have all the ewes and lambs to go and the hoggets, so a fair bit of work lined up for the dogs yet. Shearing is a bit less fast paced than lamb marking and crutching so I usually get a chance to try all the young dogs out in the shearing shed and in the paddocks. I quite enjoy it actually, as the men are usually busy elswhere, leaving me to work the sheep by myself which I certainly prefer. I had to move a mob of 500 shorn sheep the other day and they can be really tricky, fresh off shears and ready to run anywhere. This is where dogs like Rio are the best. She will swing so wide you are battling to see her. In fact when the sheep bolted down a gully towards a fence Rio headed to the lead and I could not see her anywhere, but the sheep did and I could see them watching her, then I spotted her ears sticking up out of the long grass. She lacks push but can certainly hold up the sheep and does it without spooking them as she is out so wide. Angel shows the same tendencies but has more push than Rio and not quite as much cover. We have had a heap more rain so the grass is still very green and thick in the gullies although the hills are drying out fast now. The weather is warming up again, after a spell cold enough to for us to need to scrounge up some firewood to light our fire again. Unfortunately with the dry grass comes the grasseeds, and the need to check all the dogs after they have had a run or have been working. Ears are the worst but hard to see them once they have gone inside. I thought about putting a stocking over their heads but the dogs might scrape it off. Paws are the next worse and those tiny seeds can quickly go in. Also young woolly lambs can get them in their eyes so we keep a close check on them. Hopefully they will be shorn in the next few weeks anyway. The peacocks are nesting. I found one sitting on six eggs this afternoon, under the old shearing shed. They are so vunerable to foxes at this time so I may take the eggs off her and put them under a hen for safekeeping. I hate to deprive her off her babies but I have lost a few hens and eggs. I may attempt first to put her and her eggs in a pen where she will be safe but she will probably get too upset and decide not to sit at all. They are fairly touchy. Balto is going through a ‘na, na, na, you can't catch me stage, very annoying. He has been a little spoiled since he got sick, so is now going to earn his food and start being treated like a real dog and not a pampered lap dog. Mango is also going through an annoying stage, trying to climb the social ladder and hasseling the other dogs, so hopefully it will pass soon. We really have to bear with them through these awkward stages. It is too easy to move on a good dog just because it is hitting a ‘bad’ patch, so sometimes it is worth waiting until they ‘come out the other side’ so to speak. 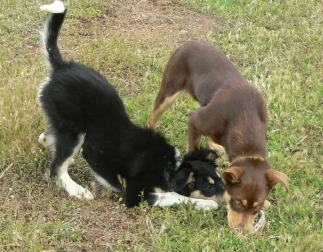 I have added some new videos, of my dogs in the paddock and Yindi working a few extra sheep. Yindi is developing into a lovely little dog on sheep, but can also be annoying when with the other dogs. Teenage years perhaps, but it will pass. Karen Buller dog Monty a full brother to Yindi is also working nicely. My husband shore my five big girls the other day and they were indeed huge. I have had them as trainer sheep for about 4 years and they are lovely and quiet but too big to use in the yard. (They knock over the handlers) so I keep them in a creek padddock for a bit of casting practise. which doesn't happen very often though it should. Sigh!